For Bamboo, see separate listing below. Miscanthus 'Giganteus' - Giant Miscanthus - Ornamental Grass - Sometimes sold as Miscanthus floridulus. Muhlenbergia capillaris var. filipes - Ruby Muhly - Ornamental Grass - This variety is larger than the species. Poa annua - Annual Bluegrass - Winter Annual - A weed to some, it is a very common cool-season component of turf in this region. Setaria plicata - Asian Palm Grass - Tender Ornamental Grass - Might not be so tender after all. Plants so named, obtained from the U.C. Botanical Garden at Berkeley, have all resprouted after the cold winter of 2013-2014. Setaria poiretiana - Mexican Palm Grass - Half-Hardy Ornamental Grass - The selections grown from seed collected in high elevation, cloud forest habitats in central Mexico grow very well in San Antonio and Austin. Thysanolaena maxima - Tiger Grass - Ornamental Grass - A tall, completely root-hardy perennial for shady sites. Zizania texana - Texas Wild Rice - Ornamental Grass - A perennial at its type locality, this plant grows as a prolific, almost weedy, reseeding annual in tubs or water gardens. It is spectacular in late summer and fall when its spikes reach 10 to 12 feet high, with 4 to 6 foot long leaves. Does best in 3 to 5 gallon pots of heavy, clay soil (with no organic matter) in 12" to 14" of water. In cultivation, it can germinate as early as late January and the seedlings should be protected from hard freezes. Being a heavy feeder, it responds well to 3 to 5 of the 21-gram, 2-year fertilizer tablets in the pot. Texas Wild Rice is not endemic to its type locality, Spring Lake and its surroundings in San Marcos. This species actually has three known natural habitats - San Marcos River, along the Trinity River about 100 miles N of Houston. and along the Pearl River in southern Mississippi. Scientists who feed at the federal trough (the human parasites of endangered species) will swear that Texas Wild Rice is a submerged aquatic plant whose survival requires millions of gallons of spring water of precise chemical composition and temperature. However, those who have cultivated this species for decades will tell you it is an invasive weed that thrives in shallow water and moist banks. Under such care, it grows to 10-12' high and flowers consistenly from July until first frost and sets abundant seed. It is a marvel of adaptation that it can even survive as a submerged aquatic. A federal recovery plan reported that Texas Wild Rice once choked the irrigation ditches downstream from Spring Lake. Also, a now defunct retail nursery in Austin sold container-grown Texas Wild Rice in the 1990s. It was grown for a couple of years at the San Antonio Botanical Garden in the water feature surrounded by the conservatories. I was told that an endangered species bureaucrat, Jackie M. Poole, was not amused to see it there. Zizaniopsis miliacea (new cuktivar) - Ornamental Grass - While the usual form of this native grass has all green stems, I found and am propagating a clone with the culms having a deep maroon coloration at the lower parts of each internode. A cultivar name will be selected when it is released. Zoysia spp. & hybrids - Zoysia - Turf - The cultivar, 'El Toro', is outstanding, resistant to foot-traffic and drought-tolerant. While I grow most of these bamboo species, beginners (and those concerned about invasive forms) should start with Bambusa multiplex and its many selections as well as the tree-like Bambusa textilis. I forgive you if your first reaction on reading the word, bamboo, is complete revulsion. Fewer plants inspire more horror or curses. While such feelings might be warranted in the case of the more invasive forms of running bamboos, the clumping types are innocent. Their spread is naturally restrained. The hardy species of the genus Bambusa range from small shrubs to arboreal giants exceeding 50 feet tall. 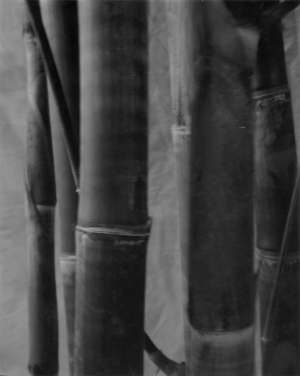 The largest canes in this black and white photograph are 2.5 inches in diameter and over 30 feet tall. Indocalamus tesselatus - Hardy Bamboo - Mine flowered sporadically for a few years beginning in mid 2002 and syrvived.